Hypericum tricolor. Variegated St. Johns Wort. Blooms: Yellow blooms appear in Summer. 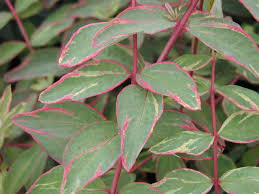 Hardy easy to grow shrubby low-growing perennial. Evergreen in USDA Zones 8-10. Mature Size: 12 - 24 inches tall and up to 3 feet wide. Size Shipped: Gallon pot. Shipped without pot but not bare root. Priority Shipping included in list price.